Sigra has a number of laboratory procedures for determining rock properties. Their selection depends on the information that is required. It is most unusual to just measure rock strength when determining rock properties. Usually testing involves determining the stress – strain behaviour of the rock as well as strength. This is then used with the results of field testing to determine in-situ stress and in numerical models to determine how stresses will change with excavation or fluid withdrawal. 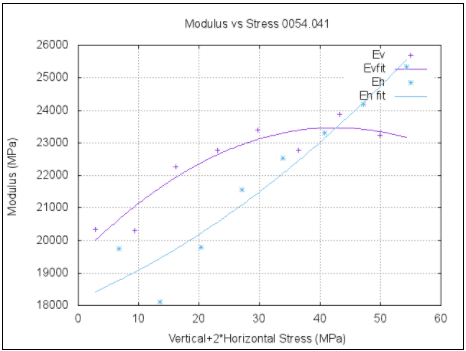 All sedimentary rocks exhibit variability in both Young’s modulus and Poisson’s ratio under different stresses. Some of our more innovative work is in the understanding of rock matrix properties under load. Sigra measures Biot’s coefficient which controls how fluid pressure influences effective stress. In its simplest form the process involves loading the sample to failure and recording the uniaxial stress at failure. This involves measuring the stress strain properties of a core that is subject to uniaxial compression. Sigra undertakes this using a universal test machine that loads the samples axially. Sigra applies to the sample, two axial and two circumferential strain gauges, and records the deformation with load. This may be undertaken with an increasing load to failure, or more usually Sigra undertakes this in cyclical loading so that the unloading characteristics of the sample may be determined. The unloading characteristics of rocks are particularly important because much of the stress change associated with mining is in the unloading mode. 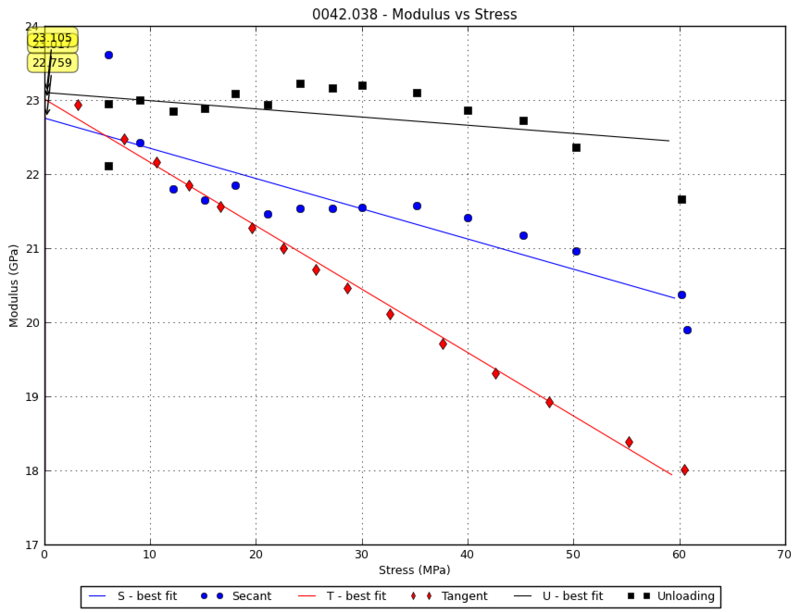 The unloading modulus is also particularly important, as unloading occurs during the overcore stress measurement that Sigra uses in its IST process. Because some rocks display significant anisotropy in Young’s modulus and Poisson’s ratio, it is important to know what these values are. To do this Sigra has built a triaxial cell in which a strain gauged core sample can be loaded axially and radially. 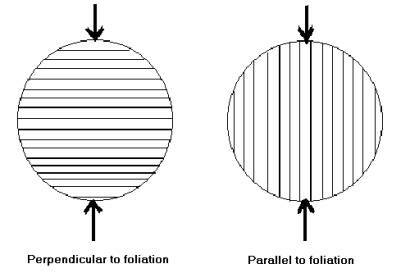 The core is loaded sequentially, with increases in axial and then radial load followed by stepwise reductions. This permits the modulus to be determined axially and radially. This system can also be used with overcore samples from Sigra’s IST stress measurement system. Biot’s coefficient is a poroelastic constant that describes what fraction of fluid pressure acts to resist total stress. In soils this has been shown to be unity and the assumption is frequently made that it is close to unity in rock. However this may not be the case, even in some obviously porous rocks. As effective stress, rather than total stress, is what governs the deformation of a rock mass and its ultimate failure Biot’s coefficient must be measured. Sigra have developed techniques to measure Biot’s coefficient under varying axial and confining pressures. 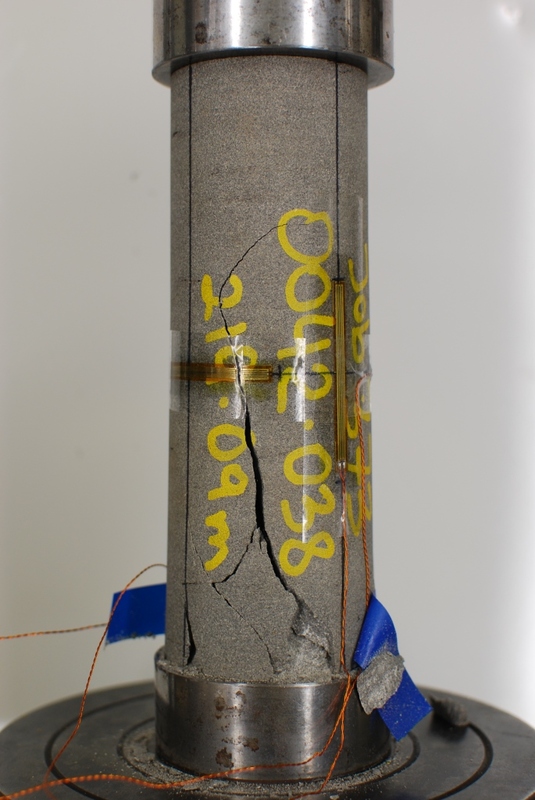 Because some rocks are only retrieved in a broken state and cannot be tested as a whole core, Sigra has developed a system to measure the rock deformation under hydrostatic loading. This technique has been found to be particularly useful in dealing with coals which break up on coring. The method involves strain gauging the rock fragment with multiple rosettes, casting it in a soft resin, and then hydrostatically loading it while recording the strain changes. 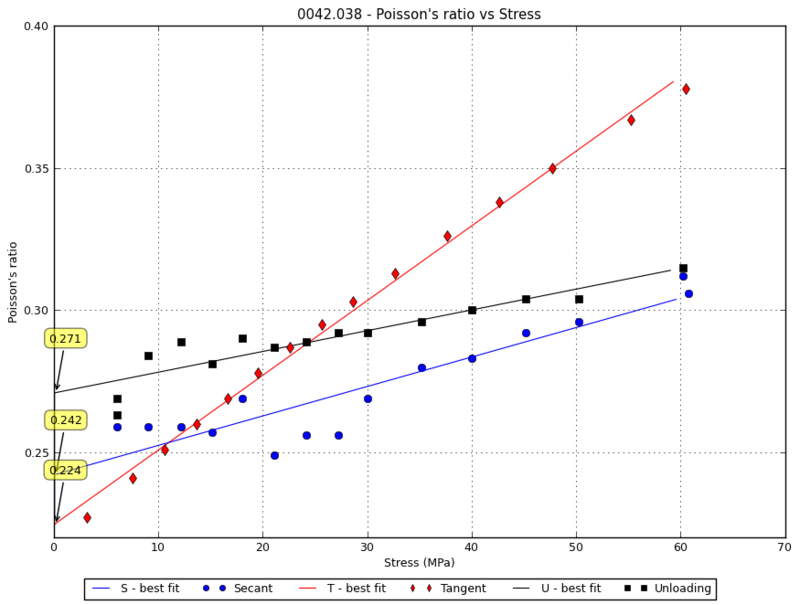 Because the test technique does not generate any deviatoric loading, the Poisson’s ratio cannot be deduced. However by estimating Poisson’s ratio from a similar material, it is possible to calculate Young’s modulus of the sample. The principal moduli may be determined in anisotropic samples. Sigra offers the Brazilian indirect tensile test (Figure 7), to measure the tensile stress of a rock by loading a core across its diameter. 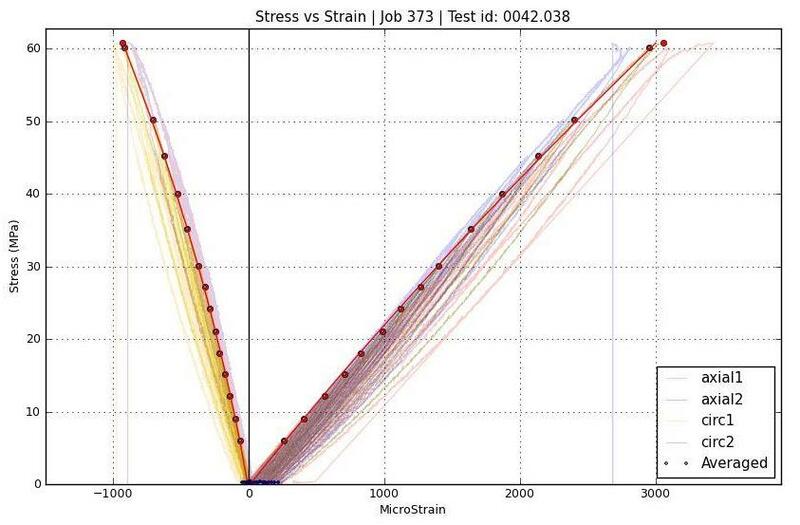 This test may be augmented by strain gauging the ends of the sample so that its total state of strain and a calculated state of stress may be determined when failure occurs. Sigra can also undertake direct tensile testing by adhering endcaps to a sample and gradually increasing the load until failure occurs. Most toughness testing on rock is undertaken using the Protodyakanov Index test. This is a drop hammer test on samples where the degree of fragmentation is determined following hammering. This is particularly useful in the determination of the outburst propensity of coals. It is also used in determining the suitability of coals to be mined by hydraulic sluicing. To determine the outburst propensity of coal seams the Protodyakonov hammer test is used to obtain a measure of the toughness of the coal seam samples. 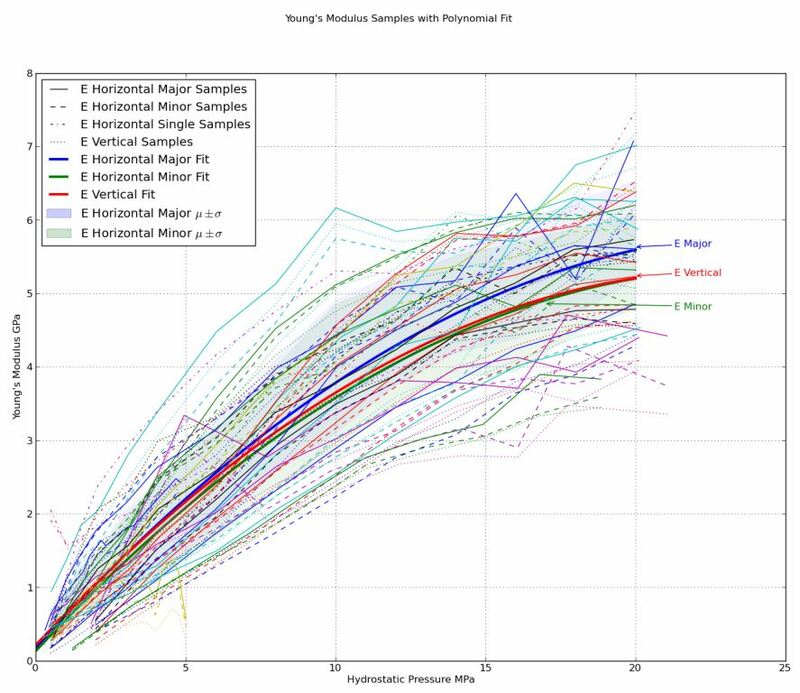 The test yields a result in terms of the Protodyakanov test index (f) which is derived from individually testing five samples from each section of a seam. Values of f lower than 0.5 are regarded as being indicative of a coal that is likely to outburst if other factors that contribute to outbursting are present. These other factors are the presence of gas at pressure and that there is sufficient stress to cause failure. These observations need to be considered in conjunction with all the other relevant parameters, including gas content, gas pressure, the structure of the coal – both in a micro and macro sense and the stress within the coal before coming to a final determination on the outburst propensity of these coal seams.